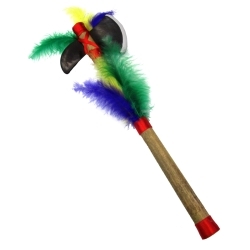 This hatchet is a great prop for Indian and Native American characters, like Princess Tiger Lily from Peter Pan. The handle is made of wood and trimmed with feathers and the head is made of rubber. Item measures 15".